Download free ADHD behavior charts, an effective behavioral treatment for children with hyperactivity or other more intense behaviors, such as hitting and biting. Finding the right chart kids with this disorder can be difficult. 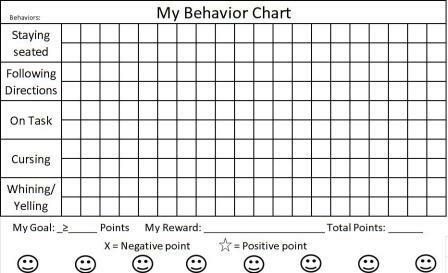 I have created these to be different from my other reward charts because they allow you to monitor behaviors you are hoping to increase and/or decrease by using a point system. When used in combination with other ADHD treatments, these can be helpful in eliminating bad behaviors. They are also great for decreasing other symptoms, such as talking out of turn or refusing to follow directions. Each time your child does a desirable behavior (e.g. completes assigned chores for kids) he/she earns a point and then loses a point for those that are undesirable (e.g. talking out of turn). A goal is set for a certain number of points to be earned in order to obtain a reward. Behaviors can be worth more points than others depending on their severity, but be sure to note how much each one is worth in the box it is listed. Although these can technically be used with all children, be careful using them with children that may escalate into severe aggressive behavior when losing points. 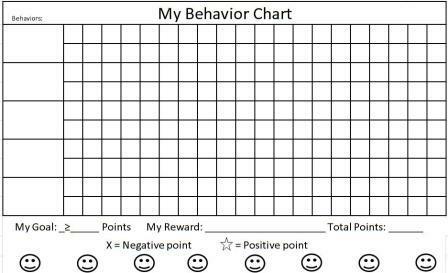 You may have better luck downloading a printable reward chart focused only on positive behaviors. If you know you will be consistent and not give in to tantrums when points are lost, then this could be a good option for you! You will need adobe reader to download the ADHD behavior charts. A link to download this is below. You will need Adobe Reader (the latest version is recommended) installed on your computer in order to open a chart. You can get Adobe Reader here (a new window will open so you can download it without leaving this page, but you will need to temporarily disable any pop up blockers to open the new window). If you want to open the file in your browser window, just click on one of the images. However, if you want to download the file to view later, then right-click on the link and choose "Save Target As" or "Save File As." Then select where you want to save the file on your hard drive. The immediate presentation of points or loss of points is considered to be one of the most effective treatments for children with symptoms of attention deficit hyperactivity disorder because of their need for immediate gratification. Just be sure to also check out the strategies in my free eBook to be used with ADHD behavior charts to help prevent bad behavior problems as well as other ADHD treatments.